Located on the San Marcos River near the city of Luling, this six-mile river trail can be floated in two to four hours. Paddlers will enjoy a gentle family-friendly ride on this quiet river lined with beautiful trees and wildlife. The put-in for this paddling trail is located just Southeast of where Highway 90 crosses the San Marcos River, approximately 5 miles west of Luling. The take-out is at the park off of Highway 80 (Magnolia Ave.) across the river from the historic Zedler Mill, which is located within the Luling City limits. There is a dam beyond the mill, so pay close attention so as not to pass this take-out. Parking is available at both locations and a shuttle vehicle can be left free of charge at either site. Download PDF version of map of the Luling Zedler Mill Paddling Trail (PDF 38.9 KB) which includes trail description and safety information. This is a very gentle river in normal conditions, with a variety of water types present, including small (typically Class I) rapids and an abundance of clear, quiet pools. Although there are no man-made obstructions on this segment of the river, snags and log-jams are numerous and special care should be taken in navigating these sections, especially when water levels are low. This section of the river supports largemouth and smallmouth bass, gar, and a variety of sunfish and catfish. Small lures such as jigs, plastic worms, spinner baits and light line are recommended. The San Marcos River corridor supports a diversity of plants and animals. It is a premier birding destination with a variety of migratory species visiting the area. Sightings include osprey, egrets, herons, kingfishers, hawks, sandpipers, phoebes, and turkeys. You will see native cypress, oak, and pecan trees, as well as many non-native tree and plant species. Common wildlife encountered are deer, armadillos, and squirrels. Respect private property by not trespassing or littering and keeping noise levels down. 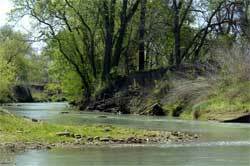 The San Marcos River is classified as navigable, which permits public use of the streambed and, if necessary, the banks to portage any hazard. Any other use of private river banks without permission of the landowner can be considered trespassing. Under Texas Penal Code (§30.05), criminal trespassing occurs when one enters property that is fenced, posted by signs, marked with purple paint on posts or trees or when one enters property after receiving verbal notice from the landowner. The Zedler Mill Classic will take place in April at the historic Zedler Mill on the San Marcos River in Luling. This event will feature canoe races, a golf tourney and a 5K fun run, plus food and music for the whole family. For more information visit <www.zedlermill.com> or call (830) 875-3214, ext. 4. 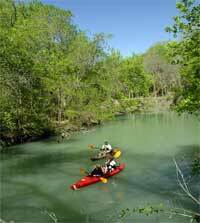 Luling Zedler Mill Paddling Trail will also serve as a part of the river route for the longstanding Texas Water Safari race which takes place in June of each year. Luling Zedler Mill was built in 1874 as a gristmill, cotton gin, and sawmill. 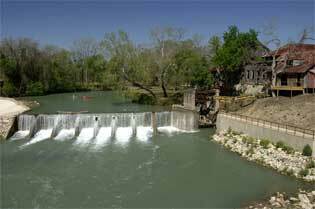 The historic mill and surrounding nine acres are owned by the city of Luling. Restoration plans include a restaurant, museum, amphitheater, and pavilion. For details about the April Zedler Mill Classic canoe race and October Catfish and Pie Cook-off, visit <www.zedlermill.com>. Palmetto State Park offers camping and day use. It is an additional 14 miles downstream from the Zedler Mill takeout. River use is recommended for experienced paddlers only at this time. This paddling trail was made possible by a cooperative partnership of the City of Luling, the Zedler-Mill Steering Committee, the Luling Economic Development Board, TPWD and the Guadalupe-Blanco River Authority. Phone: (512)749-2350; Operate by reservation only. Able to accommodate large groups.